The happy ending story of a woman who couldn’t have children and now has twins - IVF Czech Republic s.r.o. Not everybody knows how deep the suffering of the infertile women is, since they cannot have children naturally. Many of them fall into depression and need psychological conciliation to overcome this difficult period. As if suffering wouldn’t be enough, in Romania, infertile women have to take another battle also: the battle with the medical system. Here’s the story of a mother who tried for years to have kids and succeeded very hard, only after she made in vitro fertilization in a clinic abroad. Carmen Ganea is a happy mother now. She has two wonderful twins, a 1 year and a half old boy and girl. But no one can imagine the drama Carmen went through for years, until she managed to fulfill her dream of becoming a mother. She started the battle with the infertility in 2011, and one year later she made the first IVF procedure. 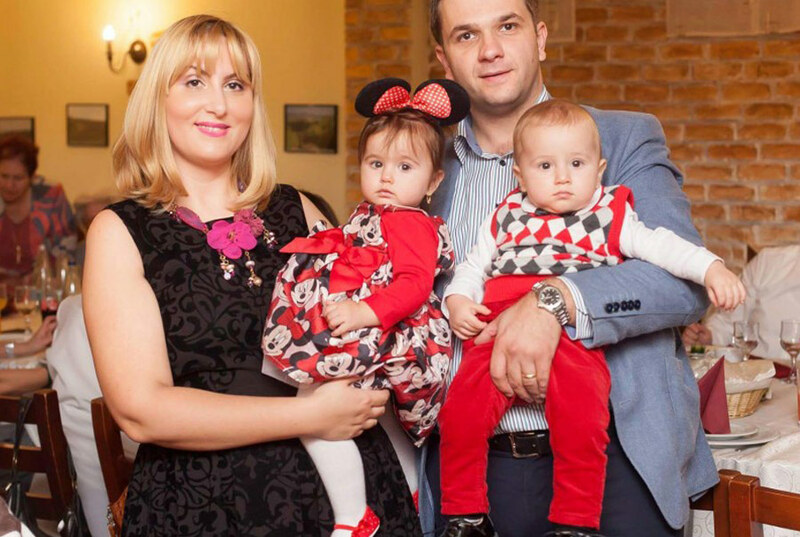 She made several IVF procedures in different renowned clinics from Bucharest and from across the country, but she couldn’t get the expected result. Early in 2014, her dream came true, after she decided to go to an IVF clinic from the city of Zlin, Czech Republic. Then she realized what a huge difference is between the approach of the doctors in Romania and abroad. “I am sure there are wonderful doctors also in Romania, but I can say without hesitation that there is no comparison. There are a lot of differences, but I think the most important one is the respect in treating patients. I am sorry to say that in Romania, assisted reproduction clinics are a profitable business, where the accent is on the financial side, to the detriment of the patient. The medical protocol is a standard one, it isn’t personalized depending on the patient’s problems, they guide you to make a lot of medical investigations and everything is delayed, to make you spend as more money as possible, but without a concrete result. You are not clearly told what problems do you have to face and what the solutions are”, sadly relates Carmen Ganea. However, she says that choosing to follow the treatment to the Zlin IVF clinic was the best decision she took: the intervention succeeded in first attempt, and Carmen became pregnant with twins. Babies came into the world on November, 2014. It had been four years of expectations and cruel disappointments. Carmen says each failed procedure meant a real drama for her and her husband. Besides the painful interventions, the huge amounts of money spent and the unfulfilled hopes, she says she faced the coldness and the lack of understanding of the doctors in our country. “In one of the procedures, the doctor that made me the ultrasound told me drily and pressed that my body didn’t react to the treatment and that I should go and expect the specialized physician for further details. The physician was in an intervention and told me to wait him in the waiting room. I was in a deplorable state, crying out loud and feeling my breath. One person at the reception told me that I was bothering the other patients and invited me to go in a hall at the semi-basement, were my crying wasn’t bothering anybody. I sat there, on the steps, and I cried for hours, until the doctor was available. No one cared for my suffering, no one gave me a glass of water, or maybe a painkiller, anything. The doctor told me cold and drily that I can try again in six months, this is what they recommend. I don’t know how I left and went home. It took me not six months, but one year to get up the nerve to repeat the medical investigations”, Carmen remembers with tears in her eyes. When she decided to go to a clinic abroad, everything changed for Carmen. She realized that things can be different, that doctors can work in an organized and efficient manner. “She was suffering a lot and she wasn’t understanding what is going on to her, what’s wrong with her or her husband. After almost three years of treatments and investigations, no doctor could provide her a clear diagnosis. Of course, without a diagnosis, you can’t have an efficient treatment. A couple facing fertility problems is very sensitive emotionally and each failure is a trauma. The mission of a clinic is not only to apply medical procedures, but also to provide the patient with all the support he/she needs, to use all the resources for the patient’s success. I managed to help Carmen, answering to all of her questions and clearly saying what investigations she has to do before going to the clinic in Zlin. Thus, once she went there, everything went well and the result immediately appeared”, says Adina Vochin. Carmen hopes the Romanian medical system will radically change, and the infertile women will be treated with the same professionalism and understanding as they are now treated in the clinics abroad.